Daleys Fruit Tree has Plants for Sale to North Branch and can Mail Order them to you door. Click to Find out how much Freight Will Cost. Romeo is a variety from the Garden Larder breeding/selection program. 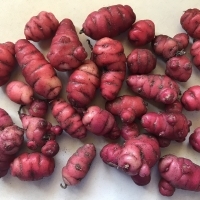 The tubers are dark pink on a creamy background with darker eyes. 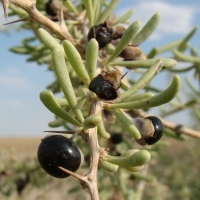 It is an average producer of 1/2 to one kg per plant. Tubers vary in size with many med to large. Cook like potatoes, usually roasted until soft, but can be microwaved or added to stews. If you leave the tubers to dehydrate they become sweet, often sweet enough to eat like you would dried fruit. Juliet is a variety from the Garden Larder breeding/selection program. 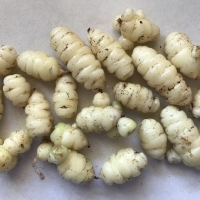 The tubers are off white coloured but occasionally with the slightest pink tinge. 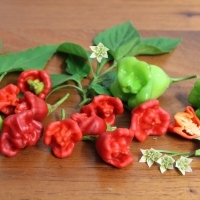 It is an average producer of 1/2 to 3/4 kg per plant. Tubers vary in size with many small. Cook like potatoes, usually roasted until soft, but can be microwaved or added to stews. If you leave the tubers to dehydrate they become sweet, often sweet enough to eat like you would dried fruit.